There are cookies, and there are CHRISTMAS COOKIES . I love baking treats during the holiday season that I wouldn’t get the chance to otherwise, like my Chocolate Mint Chocolate Chip Cookies, Buttered Rum Meltaways, and Gingerbread White Chocolate Blondies. 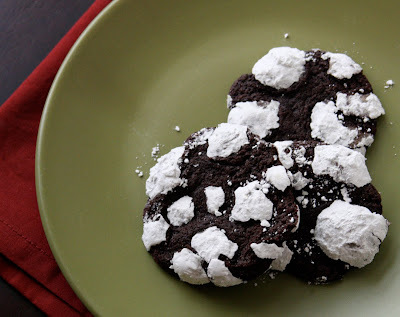 Snowcaps, now, that sure doesn’t sound like a cookie you’d bake in June! From the moment I saw these cookies, I knew I’d be baking them this Christmas. The only problem was, that gave me a lot of time to think about how badly I wanted one. I’m happy to report that these cookies are actually better than I’d hoped! 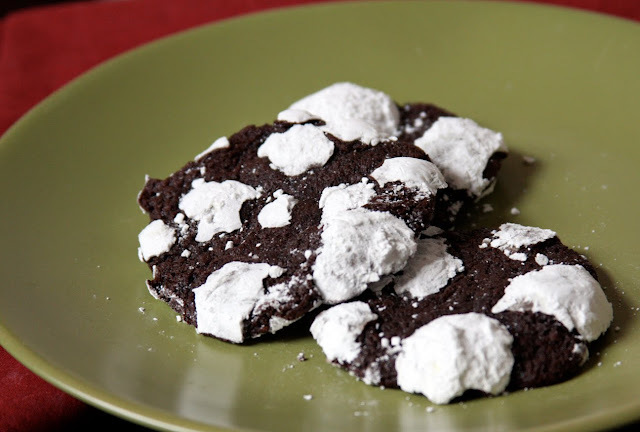 The end result is a cookie that is so soft and chewy, it’s almost brownie-like. The espresso adds a definite complexity that really pushes these cookies a step beyond your average chocolate crinkle cookies. One of the great things about this cookie is, you can make the dough a couple days in advance and then just roll out and bake them when you need them. As a warning, these get a little bit messy in the rolling process. I would scoop the dough with my medium cookie scoop, then roll it into a ball, and roll the ball around in the powdered sugar. I ended up licking and then washing my hands every 3-4 cookies. Other than slight mess, these were a fun cookie to make, and I can’t wait to make them again next year. Hurry up, your window of opportunity to make these this year is running out! In a medium bowl, whisk together flour, cocoa, espresso, baking powder, and salt. With an electric mixer, beat butter and brown sugar until light and fluffy. Beat in egg until well combined; mix in cooled chocolate. With mixer on low speed, gradually add dry ingredients; beat in milk just until combined. Flatten dough into a disk; wrap in plastic. Freeze until firm, about 45 minutes. Preheat oven to 350 degrees. Line two baking sheets with parchment paper. Shape dough into 1-inch balls. Place confectioners' sugar into a medium bowl; working in batches, roll balls in sugar twice. Place balls on prepared baking sheets, 2 inches apart. Bake, rotating sheets halfway through, until cookies have spread and coating is cracked, 12 to 14 minutes; cookies will still be soft to the touch. Transfer to a wire rack to cool completely. I've seen so many of this cookie being posted that I am seriously contemplating on trying this over this holiday period. Gorgeous clicks! I made these tonight and they are delish! Thanks for sharing the recipe. I've always known these cookies as chocolate pixies. Your recipe is butter-based, while the recipe I use is oil-based. I actually did a comparison between the two basic recipes and found that the butter-based recipes are more cookie-like, while the oil-based one is more brownie-like. Next time I make these, I'll take a little something from your recipe and add a little instant espresso to the recipe, which should accentuate the chocolate. Yum! A delicious espresso kick inside a beautiful cookie. The inside was so soft and perfect. A little tedious for so few cookies, especially since I found the dough extremely soft (and I didn’t add any milk! )… but definitely worth it.